Let’s be honest, we all love food. Delicious food in pretty packaging is just absolutely irresistible, it can make a perfect present or a treat for yourself, and whether you want savoury preserves, chutneys and dips or sweet jam, tasty biscuits and melt-in-the-mouth chocolate. 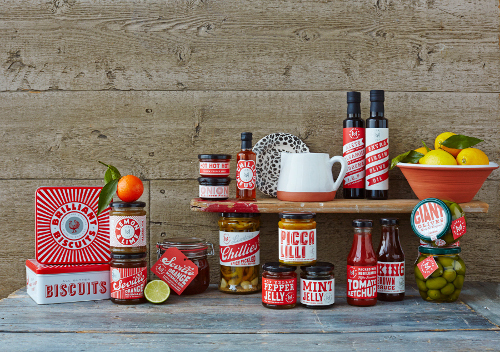 Over the past few months we’ve found some new brands that will excite any foodie, with ridiculously tasty products presented in gorgeous packaging. First off let’s talk about Cartwright & Butler, a company that began selling homemade jam in 1981 from a craft gallery in a small coastal town in Yorkshire. 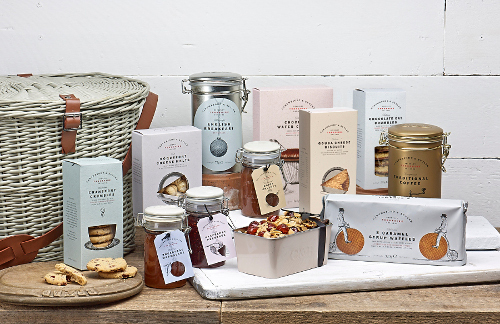 The Cartwright & Butler range makes me think of a quaint country kitchen, with pastel packaging including reusable biscuit tins and recyclable cardboard. Everything they produce has an air of homemade, and most of the range is made in the UK, with certain products made abroad by artisan producers to capture an authentic flavour. Along with traditional biscuits made with real butter, Cartwright & Butler produce cheese flavoured biscuits and preserves prepared in Kilner style jars you can use over and over again. They even produce beautiful hampers that will make an absolutely great gift for your loved ones, filled with tea, coffee, sweet biscuits, savoury biscuits, jams and chutneys presented in beautiful painted baskets. If you’re looking for tasty food to match a more modern kitchen, then Makers & Merchants is the perfect choice. 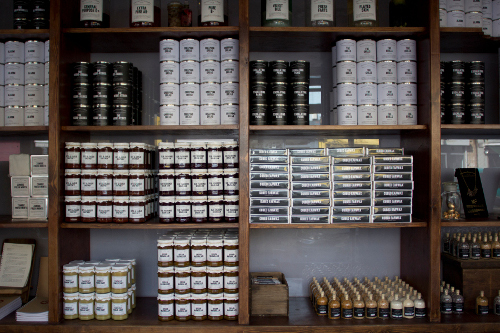 They source their products from local artisans, with condiments and preserves produced in the English Countryside, along with Fairtrade labelled Chocolate bars in a variety of flavours to tantalise your tastebuds. The only Makers & Merchants products not made in England are oils, vinegars and a Christmas Panettone, all made by artisan producers in Italy using the finest ingredients for an exquisite dining experience. I love the look of all of Makers & Merchants foods, the packaging is just fantastic, with a sophisticated yet playful feel, again they make perfect gifts or a fancy treat to keep in your own kitchen. And if you haven’t heard of Hoxton Street Monster Supplies then you are in for a real treat. Described as a ‘Purveyor of Quality Goods for Monsters of Every Kind’, the shop in London stocks everything from ‘Cubed Earwax’ to ‘Thickest Human Snot’. Now while that may not sound quite so appetising, you should know that it isn’t actually snot from a human being, it is in fact Lemon Curd! Hoxton Street Monster Supplies is a creation of the Ministry of Stories, a volunteer organisation created by Lucy Macnab, Nick Hornby and Ben Payne in 2010 that uses storytelling to inspire young people, helping them channel their creativity, unleash their imagination and gain valuable skills to help them later in life. Now if that’s not a good enough reason to eat some Olde Fashioned Brain Jam then I really don’t know what is! There’s still time to order presents in time for Christmas, and these products are excellent for those last minute gifts! You can also have a look at our voucher page to see how much you can save this December!